What does endometriosis look like? The appearance of endometriosis varies depending on the stage or level that the disease has reached. Endometriosis develops in the pelvic cavity in various forms which include patches on the surface of various organs in the pelvic area, the development of cysts, and can also go on to become adhesions where two areas of endometriosis are touching each other and become fused to make adhesions. The patches of endometriosis that develop are of various shapes, sizes and colours. These different colours usually reflect the different stages of the disease. Young women in the early stages of endometriosis are more likely to have clear, pink or red lesions. Unfortunately because of their clever camouflage they are also the trickier patches to recognise during surgery. Women who have had the disease longer tend to have patches that are brownish black in colour. Some women can have a mixture of both types of patches. Therefore the appearance of the patches is varied and below is a list of the different ways they can appear. These patches are red in colour because they are filled with little blood vessels and look like blisters. These young patches are the most active and may well be the main cause of the pain and 'swelling' around the infected area. They also produce their own oestrogen. These patches are most common in young women with the disease. 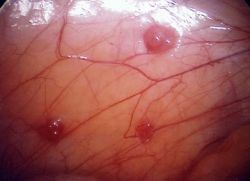 These also look like little blisters and are common in the early stages of endometriosis. They do not contain any blood vessels therefore they have an opaque appearance. These are also hard to detect during surgery and therefore may be the reason why so many women remain undiagnosed by such procedures as ultrasound. By the time patches appear black they are rendered inactive as their production of inbuilt hormones and chemicals has virtually closed down. This is at the stage when scar tissue has occurred and the scarring has blocked the blood vessels, trapping the blood and giving it a black appearance. These patches are also known as powder burn patches and are most common in older women. Over time the absorbs the black matter within the patches and leaves a thick white scar. The white tissue indicates the presence of deep infiltrating disease and the deeper it infiltrates the more painful it becomes. This is due to either invading any surrounding sensory nerves, especially in the utero-sacral ligaments or by the fibro-muscular hyperplasia. Most patches are small at about 1-2mm in size but when endometriosis has progressed to the third or fourth stage, women can also develop another larger form of endometriosis known as chocolate cysts. Basically a cyst is a growth that is filled with fluid. Chocolate cysts are actually filled with old blood. These are larger lumps that grow in ovary. They may be several centimetres in size and the fluid is a dark brown colour which where these cysts get thier name. 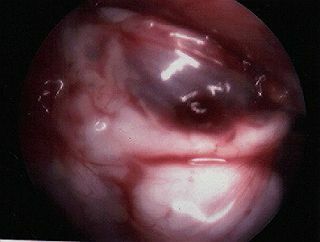 These cysts usually develop in the later stages of endometriosis.